Climb into a space where emotion meets technology, where 6 or 7 people can travel together comfortably and entertained. More fun with more peopleBring all your friends. Standard third row seats can hold 6 or 7 people, depending on the options you choose. Comparison based on standard configuration. 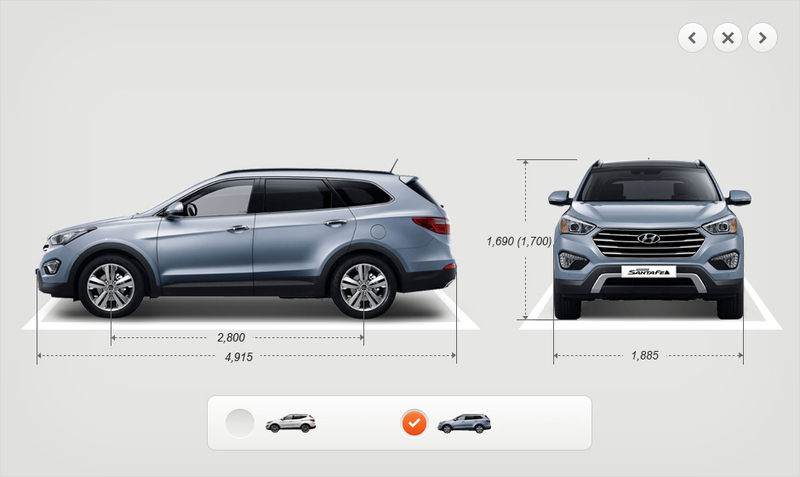 More space with greater bodySo the new Grand Santa Fe is better than its predecessor. But how much better are we talking? It’s 225mm longer, 5mm wider and 10mm higher, with a wheel base that is 10mm longer. The figure in the parentheses of the overall height is including the roof rack. 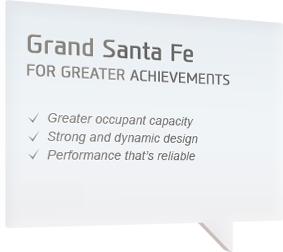 Additional 118ℓ compared to Santa Fe’s 516ℓ, means you can carry extra stuffs with the Grand Santa Fe. Have more in your way. in the city with its sophisticated style and dynamic attitude. Electronic folding outside mirrorsThis is no ordinary mirror. It's heated, for one, which means it stays clear in rain and snow. It folds electronically. And it's got puddle lamps that light the way when you're getting in. 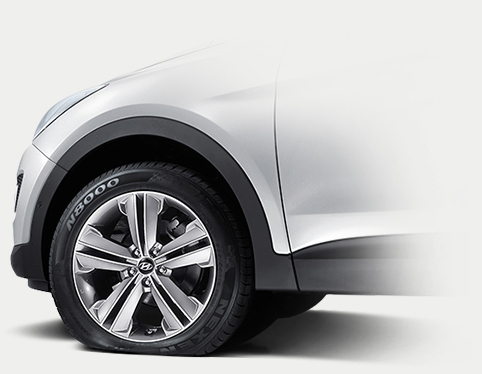 19'' and 18'' alloy wheelsAluminum 19'' and 18'' wheels give off both a sportiness and elegance that define the Grand Santa Fe. 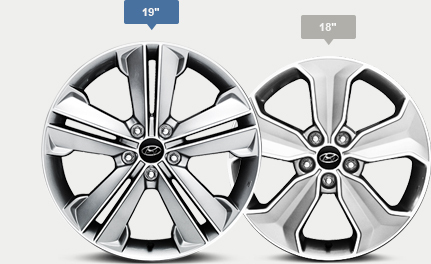 A full-sized spare alloy wheel is optional. into town. You're all there, in one intimate space, with everything you need within reach. HID headlamps with LED positioning lampsEnjoy greater visibility day and night with high-intensity discharge lamps that do more than illuminate; their rectangular lens give off a high-tech look. 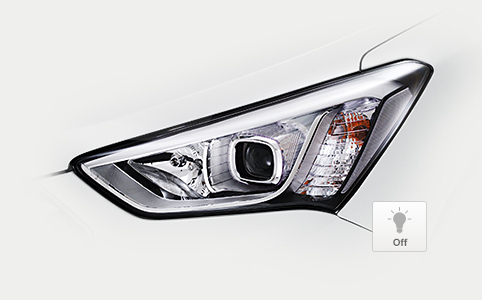 Daytime running light (DRL) makes sure other vehicles see you in the daylight in low sunlight conditions. this is an SUV that lets you seize and relish the moment. LED Rear combination lampsBoasting sophisticated design and outstanding visibility, LED rear combination lamps make a bold statement style, strengthening the vehicle's simple and clean expression. Complementing the Grand Santa Fe's slick top line, the roof rack's closed-type design and aesthetic appeal make it more than just practical. A good view from any seat. 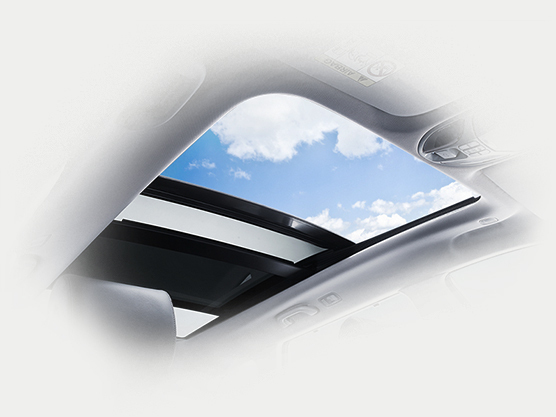 That's what you can enjoy with a wide quarter glass that provides a more open window view to passengers in the third row. Safety enhancement complements the aerodynamic rear spoiler. Integrated gracefully into the rear bumper, the dual muffler adds to the clean and elegant look. Pile everyone in and take off on a relaxing ride. A selection of classic colors lets you design the interior so everything about it – the look, the feel – is uniquely you. Panorama sunroofEnjoy more of the sun inside with a wider and longer sunroof. There’s no center beam to interrupt the openness. And a motor-driven roller blind covers it all with a coziness you can get used to. Power seatsHave a seat, your way. 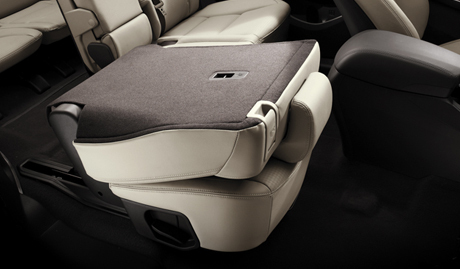 Ergonomically designed driver’s and front passenger seats can be adjusted for ultimate comfort, while 4-way lumbar support and a button-operated headrest make you even more at home. Only available in select regions. 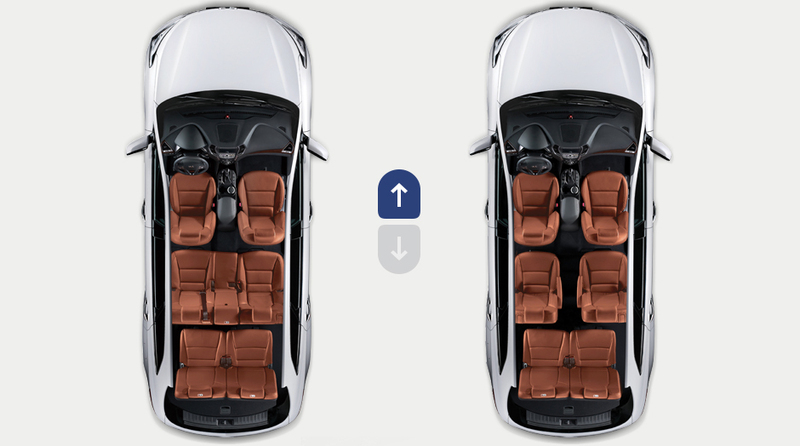 Seat variations A practical and flexible interior layout lets you get creative with how, and how many, you seat. 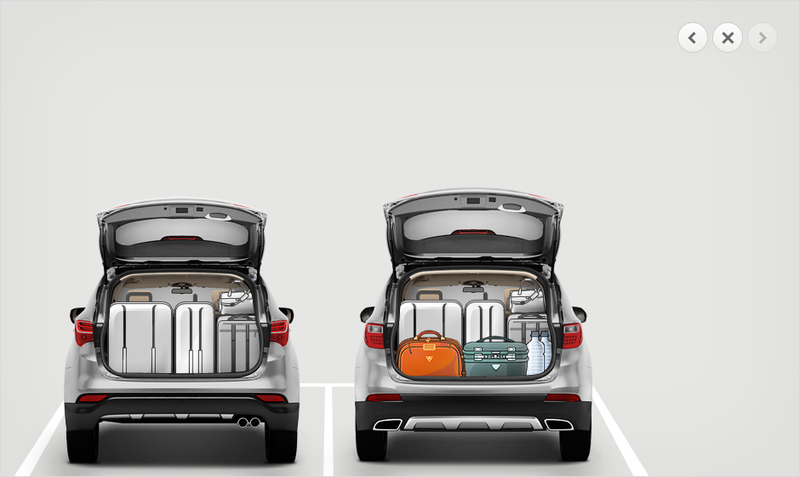 In the standard 7-seater, the second row can be divided into a 4:2:4 ratio to make room for all kinds of luggage. The second row can also slide and tilt to support your back. In the optional 6-seater, the second row comes with isolated seat configuration for maximum comfort. Integrated memory seat (IMS)Have a favorite way to sit? Save it. 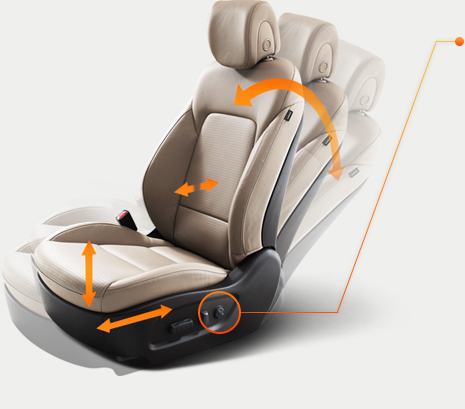 The Integrated memory seat (IMS) function recalls up to two profiles for automatic seats. You can preset up to two positions which includes angle of the outside mirrors. Ventilated seats make your travels even more fresh and joyful. Stay toasty when it's cold with heated front seats. You can rest assured knowing that passengers in the second row are kept warm as well. Only available with 6-seater option. No need to fight for shotgun. The 2nd row captain's chair in the 6-seater model slides, reclines and heats up at your command. Lean your head back in exactly the position you want. 4-way headrests let you adjust the position up, down, forward and backward. No longer just a place for manuals, the glove compartment now acts as a mini-fridge thanks to glove box cooling that can keep your drinks cold in the summer. An engine that's smaller and lighter but more powerful and eco-friendly. That's what the 3.3 MPi gasoline engine delivers. 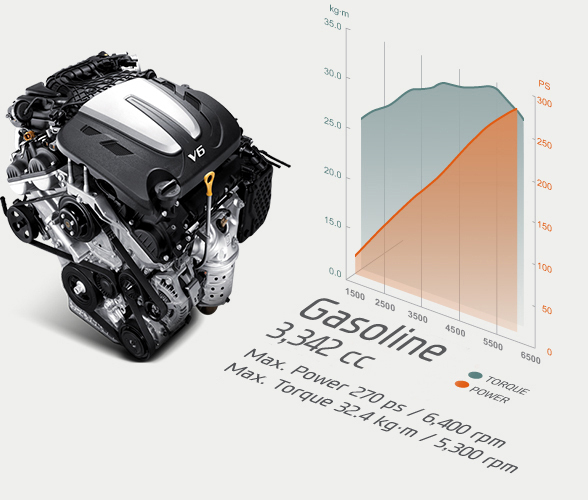 The stats: 6 cylinders, 270 ps at 6,400 rpm and 32.4 kg·m at 5,300 rpm. A friction-reducing coating application and variable oil pump mean better fuel performance. 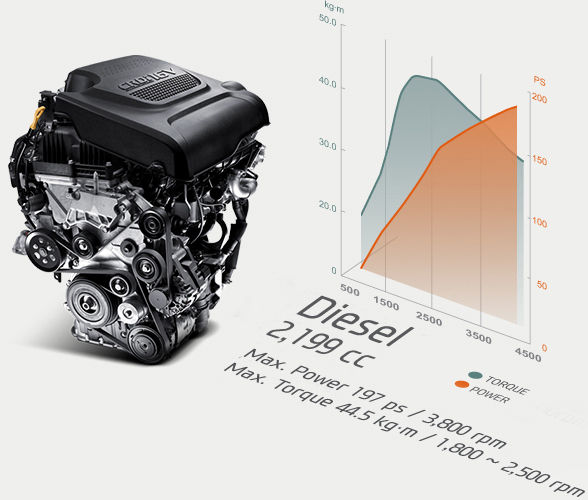 The 2.2 CRDi diesel engine boasts a maximum output of 197 ps at 3,800 rpm and maximum torque of 44.5kg·m at 1,800-2,500 rpm. A third-generation fuel-injection system makes for improved fuel economy, better performance and less noise. Automatic transmissionStandard automatic transmission offers you maximum driving comfort, greater fuel economy and a smooth and luxurious ride. 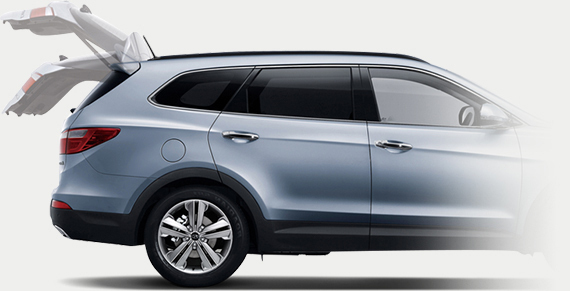 AerodynamicsThe Grand Santa Fe is impressive - even aerodynamically. With a class-leading drag coefficient level of 0.34, the vehicle boasts reduced air resistance and, ultimately, a drive that purrs. With the McPherson strut suspension system and the High performance damper (HPD) that comes with it, you'll enjoy the great performance of high-profile cars worldwide. 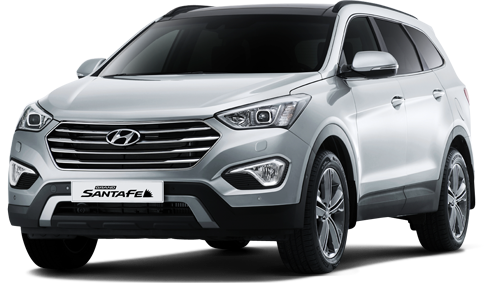 Multi-link suspensions used in luxury and sport vehicles ensure that you will find a comfortable ride and maximum vehicle stability in the Grand Santa Fe. Stop as well as you go with a 17" brake disk front, 16" disk rear and an 11" single brake booster. After all, braking is just as important as accelerating. Lane departure warning system (LDWS)Veering toward another lane without signaling? 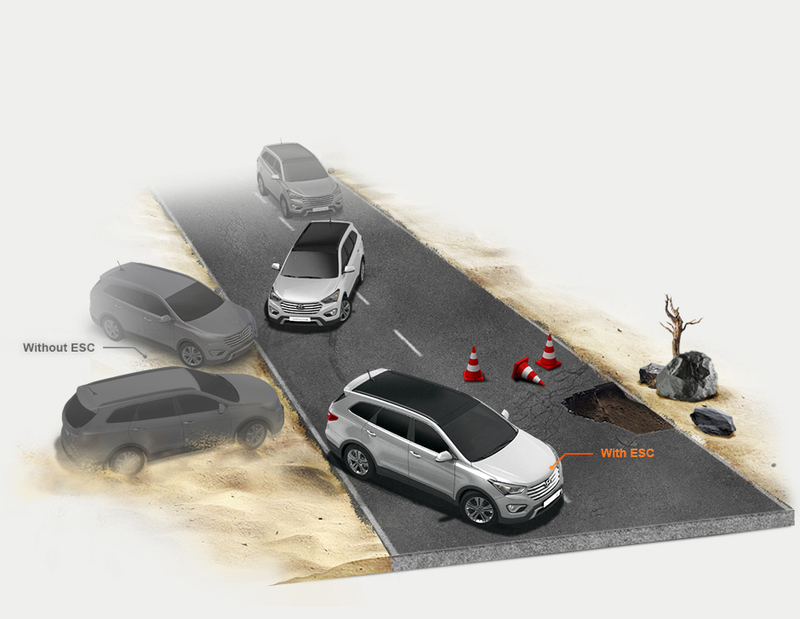 The Lane departure warning system (LDWS) will alert you. A camera mounted on top of the windshield recognizes your lane and vehicle position, acting as a cutting-edge safety mechanism. Vehicle stability management (VSM)Vehicle stability management (VSM) ensures that all four wheels keep the maximum grip no matter where there are on. 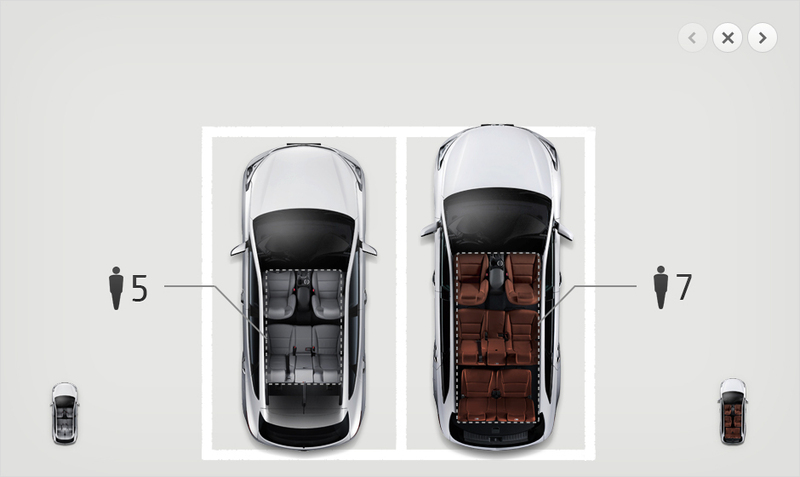 7-airbag systemGrand Santa Fe’s 7-airbag system offers a maximum defense against injury. Depowered driver and passenger airbags minimize injuries from frontal impact while side curtain airbags ensure that your passengers are protected from side impact. Knee airbag Only available in select regions. and Brake force assist system (BAS)No need to worry about your brakes locking up or skidding. 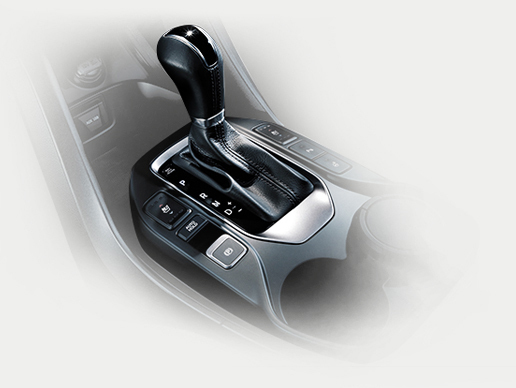 The Anti-lock brake system (ABS) compensates for over-braking and gives you better control. 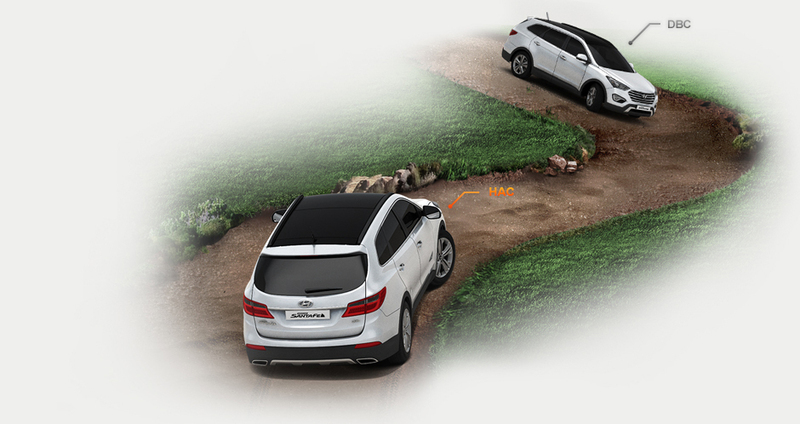 Understanding how you drive, the Brake force assist system (BAS) monitors your accelerating and braking behavior and applies maximum braking force when it senses abrupt action. Smart parking assist system (SPAS)Not the world’s best parker? Let the Grand Santa Fe park itself. 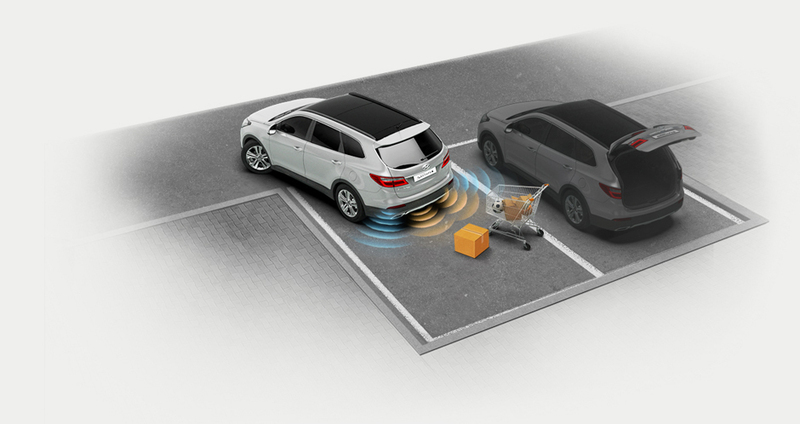 Ultrasonic sensors determine whether the space is big enough and steers the car automatically to park. You can stop the process anytime you want. Only available in select regions. Rear parking assist system (RPAS)Back up knowing the Rear parking assist system (RPAS) has your back. 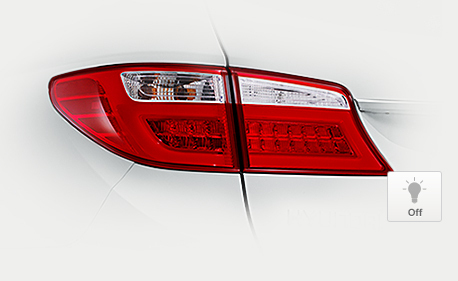 A warning sensor in the rear bumper helps prevent accidents when going in reverse. This is especially helpful when there is a small object on your way back such as a box or a low-height road block. Sensors will not miss a thing. and Hill-start assist control (HAC)Tackle inclines with confidence. Down-hill brake control (DBC) helps you maintain control while going down steep surfaces. 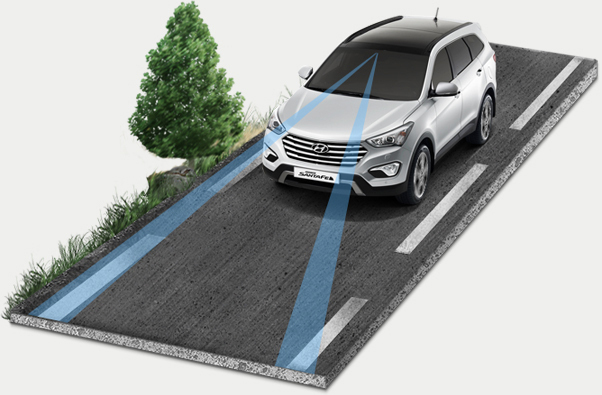 Hill-start assist control (HAC) automatically initiates brakes to prevent roll-back when going uphill. Tire pressure monitoring system (TPMS)Never wonder about tire pressure again. Leave it to the Tire pressure monitoring system (TPMS), which will let you know when tire pressure falls below normal levels. In the event of a crash, a dual pre-tensioner seatbelt will hold your pelvis down safely to minimize injury. An Emergency stop signal (ESS) in the LED rear lamps flashes hazard lights during sudden braking to reduce collisions. Gone are the days of yanking a big lever. 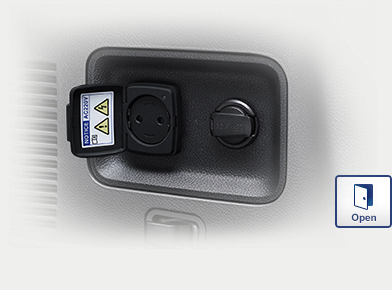 Now you can activate the parking brake with a switch. 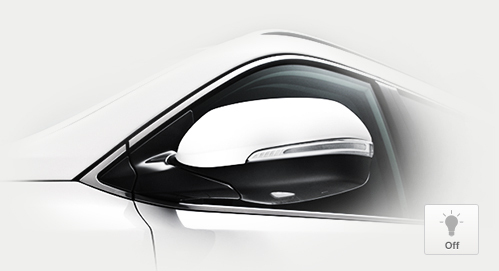 The Electric chrome mirror (ECM) works double time to help you look back and drive more safely. Choose between an ECM+compass or ECM+rear camera display.Only available in select regions. A wide-view mirror integrated into the end of the side view mirrors minimizes your blind spot.Only available in select regions. Raining? The rain sensor will detect precipitation and automatically activate the wipers. All you need to do is keep driving. Monitor all the driving and vehicle info you need with a 4.2-inch LCD screen in the supervision Thin film transistor (TFT) LCD cluster. It's sharper, more sophisticated and positively futuristic, just like the rest of the interior. Heated steering wheelSay goodbye to cold hands with a heated steering wheel that'll keep you warm. Audio controlAdjust the volume, change songs and much more, all while keeping your hands on the wheel. Phone controlDrive safely while chatting by taking, making or ending calls with just your left thumb. With the voice recognition feature, you can even tell the system to make a call not having to lift a finger. Only available in select regions. Auto cruise controlCruise control just got even more convenient. It automatically maintains the speed you set even after you've released the pedal. Flex steer™ systemSelect a mode that fits your driving preference via a switch in the steering wheel. You can change modes both while the car is still and in motion. Menu controlOperate various functions with just your right hand, and without taking your eyes off the road. Rear side window sunshadeEnjoy just the right amount of sun with a rear side window sunshade that welcomes in more natural light. 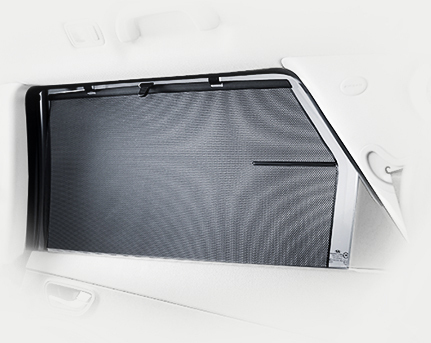 Retractable side-window sunshades are a pleasant surprise when there is too much sunlight outside. Power tailgate systemThe touch of a button from the driver's seat opens and closes the tailgate in the back. Loading and unloading bags just got a whole lot easier. Dual full auto temperature controlHave it your way, even when it comes to the air you share. 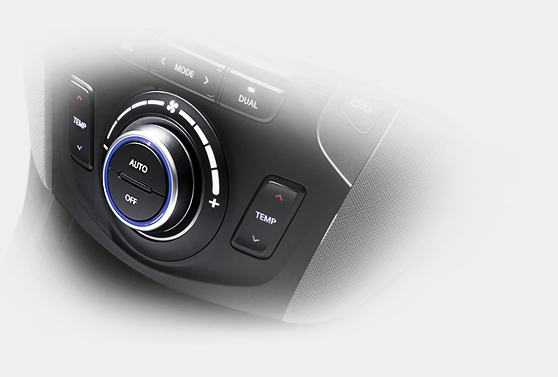 Dual full auto temperature control lets the driver and passengers set the AC to the temperature they want. 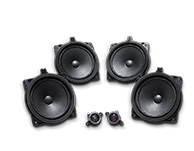 Premium sound system10 high-performance speakers plus an external amplifier (optional) - now that's a premium sound system that allows you to enjoy various media including radio, CDs, and MP3 files with outstanding crystal clear sound. 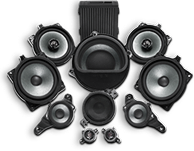 Enjoy multidimensional sound quality, no matter what seat you're in. 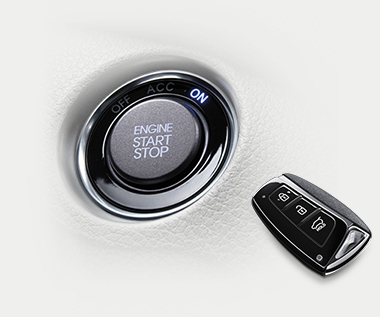 Smart key with engine start/stop button Jingling keys are so yesterday. Instead, get going with the touch of a button. inverter (depending on the region) lets you charge them on the go. Only available in select regions. 2nd row seat remote foldingNeed more luggage room? Just activate the lever to fold the second row seat and there you have it. The idea is maximum comfort with minimum effort. Next time the windows fog up, let the auto defogging system take care of things. 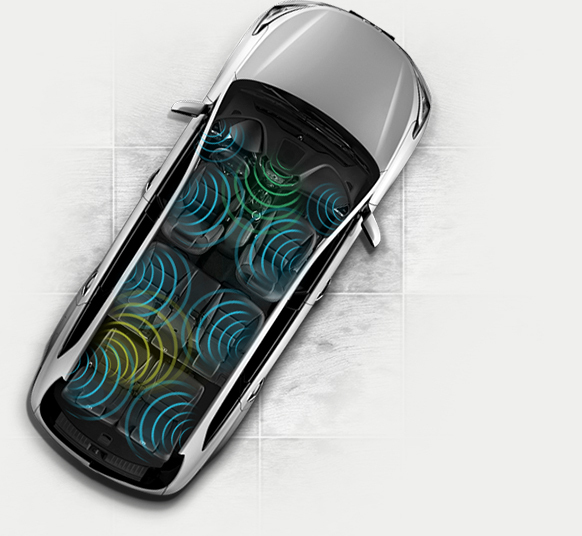 A sensor automatically detects windshield condensation and initiates climate control. Installed at the bottom of the heated windshield wiper to quickly melt frozen particles. Fresh air isn't limited to the front seats. 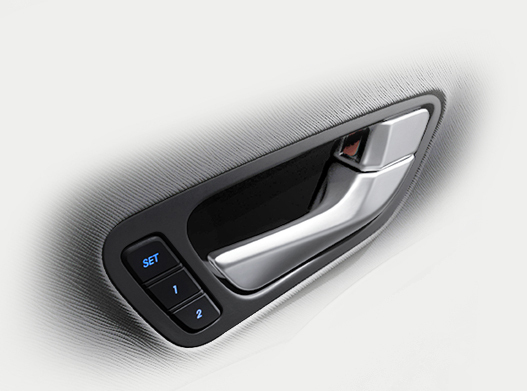 second row air ventilation creates pleasant condition for backseat passengers as well. Sitting even further back? You can still control the temperature with a heater and air conditioning system that'll keep you as cool or as toasty as you like. A rear view camera promotes safe driving and parking by enabling drivers to see the back of their vehicle through a monitor while backing up or parking.